I love a good broccoli salad and I am not afraid of mayo. But I know many people who aren’t as in love with the condiment as I am. And that’s okay. I settled on bringing broccoli salad to Easter dinner as my contribution. I was going to use my go-to recipe, which involves pasta, but then I found a non-mayo recipe on Pinterest. Those stalkers knew just what I would like! My favorite thing about this broccoli salad is that there’s lots of fruit involved – apples, blueberries, and cranberries! The poppy seed dressing is sweet and tangy and a perfect compliment to both veggie and fruit. It gets bonus points for sunflower seeds. I’m sharing the recipe today with some other Festive Foodie bloggers in honor of National Picnic Day, which is today April 23rd. I think this salad would be great for any picnic or potluck! In a large bowl, toss together the broccoli, apple, blueberries, cranberries, sunflower seeds, and red onion with 1 tbsp lemon juice. In a small bowl, whisk together the yogurt, honey, remaining lemon juice, poppy seeds, and vinegar. Pour dressing over salad to taste (I had a little dressing leftover) and serve. Thank you, Ellen of Family Around the Table, for hosting this National Picnic Day event. I think kids have a natural-born radar for sweets. The other day I was enjoying a homemade rice krispie treat and Firecracker walked over to me and took a bite of it right out of my hand. Now, he’s never seen a rice krispie treat before, how was he to know what it was?! He wouldn’t have done the same thing if it were celery in my hand instead. I was highly amused and slightly baffled. While I’m on that note: Can someone please explain to me why if it comes out of a package or box my 2 year old will devour it? As is normally the case if it comes from a restaurant. Chicken Teriyaki from the mall food court, perfect. Chicken Teriyaki made by Mom, no thanks. Maybe he sensed that the chicken wasn’t battered and fried…? My 8 month old enjoyed it at any rate. I think my husband enjoyed it most of all, if only just for the excuse to use his Darth Vader Lightsaber Chopsticks . Combine sugar, 1/2 C water, soy sauce, lemon juice, garlic, and ginger in a small saucepan. Bring to a boil over high heat. Reduce the heat to a simmer. In a small bowl whisk together the cornstarch and 2 tsbp water until smooth. Add to the sauce. Allow sauce to thicken over low heat. In a wok or large skillet, heat canola oil over medium-high heat. Season chicken with S+P, saute chicken until browned and fully cooked. Add the broccoli to the pan and cook until tender. Add as much teriyaki sauce to the chicken and broccoli as desired, tossing to coat. Serve over a bed of rice and garnish of scallions. Right before the Super Bowl the Sunday Supper Movement hosted a Big Game Day Recipes event. During that event I shared Slow Cooker Thai Wings. 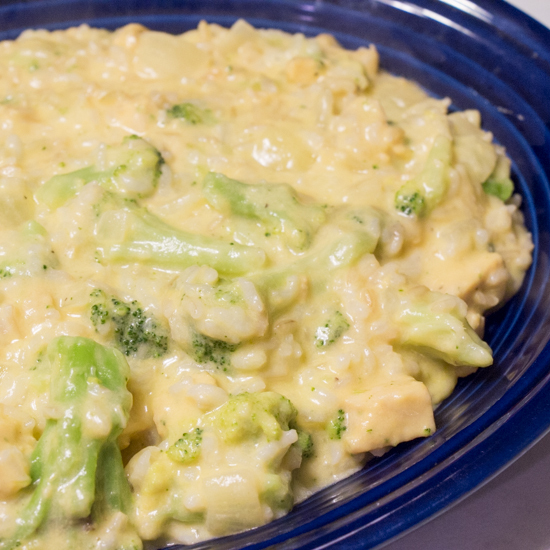 There were a good number of recipes I wanted to try, but the Roasted Broccoli Artichoke Dip by Cooking Chat was the one I’d picked to make first! With only two (maybe 2.5) of us, I halved the recipe. I shouldn’t have though, because I ate about half of it for lunch that day! The rest of it was inhaled by my husband. Between the two eating sessions, I stored the dip in the fridge. When cold, it got a little too hard for the chips to hold up against, but a quick 10-15 seconds in the microwave fixed the broken chip problem. We ate this dip with multigrain tortilla chips (our favorite! ), but it would be wonderful with pita, too. Toss broccoli in olive oil with ½ the garlic. Season with S+P. Place on a baking sheet and roast 15-20 minutes, until softened. Set aside to cool. Place broccoli, artichokes, and scallion in a food processor. Pulse until finely chopped. Add cream cheese and sour cream to the food processor and pulse until combined. Mix in the parsley, cumin, and Parmesan, pulse until fully incorporated. Add lemon juice, S+P to taste. Today’s Thanksgiving leftovers recipe is one that I’ve made in my kitchen before. I made this one pot meal last month when my mother-in-law was visiting. We had just joined Sam’s Club and had a coupon for a free rotisserie chicken! This skillet meal was a perfect way to use some of that chicken. We all went back for seconds. So when I decided to Thanksgiving leftovers leading up to Turkey Day I knew this dish would be on the menu. What makes this meal perfect for after Thanksgiving is that it only dirties one pot. Okay, two pots because you need to cook some rice ahead of time. But after a whole day of pulling out casserole dishes you forgot you had, eating on that once-a-year china, and stacking up the Tuperware it’s nice to not have to wash eight thousand dishes. This recipe can be adjusted based on your leftovers. Swap out the broccoli for some green beans or Brussels sprouts. In a high sided skillet, melt butter over medium-high heat. Saute onion and broccoli until tender. Stir in flour. Slowly mix in the milk. Allow to simmer until thickened slightly. Season with ground mustard, S+P. Add in the cooked turkey. Melt in the cheese. Mix in the rice. I love the Secret Recipe Club so much that when the opportunity presented itself to help someone out in Group B’s reveal day I jumped on it! 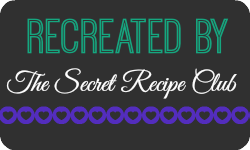 There are four groups in the Secret Recipe Club. We each post on a different Monday. As I am a member of group D, my reveal day is the fourth Monday of every month. As you can tell, group B posts on the second Monday of the month. Today! My assigned blog for this “bonus” posting is Flavors by Four, a mother daughter blogging team. I started searching through their blog and found over ten things that piqued my interest. They have a wonderful selection of appetizers which is perfect now that the holiday party season is fast approaching. If you like stuffed mushrooms I encourage you to head on over to their blog, they have a multitude of recipes to choose from including French Onion Soup and Spinach Artichoke. With American Thanksgiving on the horizon I was tempted to pick their Orange Cranberry Bread and Mini Gobbler Pies are a fantastic idea for leftovers! I’m actually making their Twice Baked Sweet Potatoes tomorrow night. I ultimately settled on Nicole’s Broccoli and Grape Pasta Salad. Frozen grapes are my favorite healthy dessert and we are on a grape kick right now. I also really like broccoli but never seem to buy it. I knew that this pasta salad would be great for me to have in the fridge as a quick lunch during the week. With a four month old I never know when I’ll be able to eat and this pasta salad sounded like a great alternative to my bagel. Of course, this would be a perfect dish to take to a potluck! 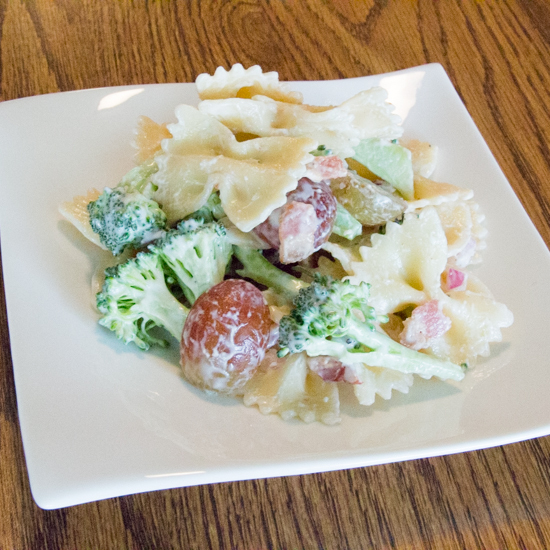 In a large bowl toss together cooked bacon, cooked pasta, grapes, broccoli, and red onion. In a medium bowl whisk together mayonnaise, vinegar, sugar, salt, and pepper. Toss pasta salad in dressing and chill in the refrigerator over night. Each year during Lent I try to reconnect with my faith. I am not the most religious girl, and I don’t often enter into conversations regarding religion and in no way offer to convert someone. I have an almost all-encompassing view of God. I was raised Catholic and when I do go to church I attend the local Catholic Church – I like the rhythm of mass. And while I don’t always agree with the Catholic viewpoint, I still get something out of each homily. I see religion as a human’s way to understand life, as a way to provide a purpose to human existence. I do believe that there is a God – I don’t have an image of God, and I definitely don’t provide Him with a human quality – more of a giant ball of light and energy. I believe that every religion is actually one in the same (not I’m not trying to spark a debate here), and that different cultures and peoples choose to understand and believe in their vision of God differently. With my blog I have decided to take a different outlook on my Lenten journey this year. It’s been a long time since I’ve given something up (candy, soda, fast food, etc) and instead I look to adding something to my life – usually it’s going to Church each Sunday (as I don’t do that weekly) or reading the New Testament. But with the blog I thought it’d be great to add a food aspect to my journey. 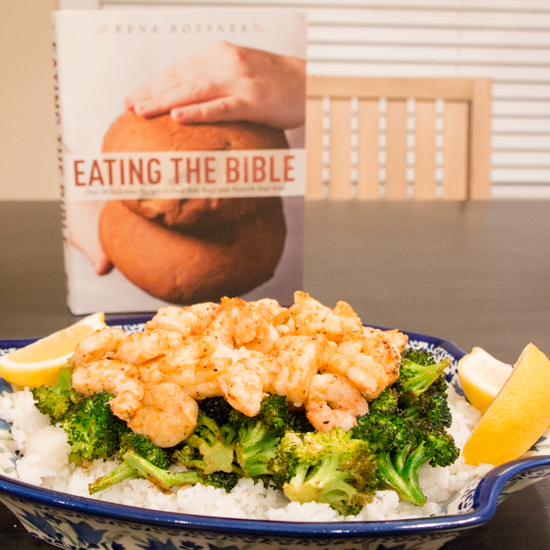 I’ve never failed a Lenten promise and I don’t want to set myself up for failure here, so two times a week (Wednesdays and Sundays) I plan to cook a recipe from Rena Rossner’s Eating the Bible. On those days my posts will be in the evening after supper. Rena took it upon herself to enrich her bible study through food. These recipes are inspired by the Old Testament. And even though Lent is about the 40 days Jesus spent wandering in the desert, renouncing the Devil and Temptation and ends with Holy Week which marks the death, burial, and resurrection of Jesus Christ (Easter! ), I can still find Rena’s cookbook to help me slow down and think about God. While she references many stories from the Old Testament, she provides “food for thought” both in recipes and in questions to ask about God. The first recipe that I’m trying from Eating the Bible is Eternal Dust which was inspired by Genesis 13:16. I feel this recipe applies greatly to Ash Wednesday. During Ash Wednesday mass, ashes are placed on our forehead in the shape of a cross while the words from Genesis 3:19 “Remember that thou art dust, and to dust thou shalt return.” are said. Ash Wednesday serves as a reminder of earthly mortality and repentance to God. Rena decided to make a spice rub, or a spice “dust”, as a compliment to this bible study. She titled her spice blend “Earthly Seasoning”. I used this “Earthly Seasoning” on roasted shrimp and broccoli which I served over rice. “Earthly Seasoning” is a mix of 1 tbsp paprika, 1 tbsp salt, 1 tbsp dry mustard, 1/2 tsp chili powder, 1 tbsp cumin, 2 tsp black pepper, 1 tbsp garlic powder, 1/2 tsp cayenne, and 1 tbsp sugar. Toss broccoli in 2 tbsp of olive oil and place on a baking sheet. Season with 1 1/2 tsp “Earthly Seasoning”. Roast for 10 minutes. Gently toss shrimp in remaining olive oil and seasoning. After broccoli has been roasting for 10 minutes flip broccoli and add the shrimp to the baking sheet. Cook another 8-10 minutes, turning half-way. Serve over rice with a squeeze of lemon. I decided to make the last option because my in-laws were in town over the long Columbus Day weekend. Having a bread available seemed like the smartest option. 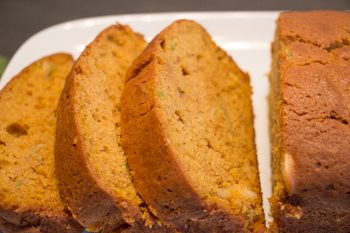 I took a Banana Zucchini Bread recipe and substituted pumpkin puree for the banana and broccoli for the zucchini. I purchased a bag of broccoli slaw from the grocery store so that I wouldn’t have to shred the broccoli myself. (If you can find a bag of just shredded broccoli I’d suggest that instead of having to pick out the red cabbage and carrot.) Zucchini has a higher moisture content than broccoli so I boiled it prior to incorporating it into the batter. In a pot of boiling water, cook broccoli for 4 minutes. Drain and pat dry between paper towels. Set aside. In a large bowl, whisk eggs and add in the sugar and oil. Add pumpkin. Mix in flour, baking powder, baking soda, and salt. Stir in pumpkin pie spice and cinnamon. Fold in broccoli and almonds. Pour batter into two loaf pans and bake for 50 minutes, until a knife come out cleanly. Note: This will make 24 muffins. To see other bloggers who participated in this month’s Crazy Ingredient Challenge, click on the link below!